Underwear. Most of us wear them every day, but we don’t spend much time talking about them. Aside from that unfortunate time in the early 2000s when showing off a “whale tail” was a hot trend, we tend to keep them hidden under our pants, skirts or dresses. While we tend to keep our undergarments private, we wanted to take a few minutes to discuss something you may have never considered: Buying underwear in bulk. If you are like most people, you probably pick up a package or a few pairs of undies when your old ones have worn out or when you need something nice for a special occasion. You probably do the same thing when you need undershirts. Changing to buying in bulk, though, could save you a lot of time and money. Here are just a few reasons why you should be buying underwear in bulk. When it comes to buying just about anything in bulk, saving money is one of the biggest perks. Underwear is no exception. No matter what style you prefer, it generally costs a lot less to buy in bulk than to purchase individual pairs or the small packages you can get at your local big box store. If you buy wholesale boxer briefs, for example, you could pay as little as $1 per pair. Wholesale undershirts can cost as little as just over $2 each. Buying in bulk also saves you money because you don’t have to make trips to the store every time you need a new pair. Grabbing a new pair out of your drawer doesn’t require you to put gas in your car or pay for shipping. It also means you won’t be tempted to spend any money on impulse purchases at the store. Imagine you are getting ready for your first day at a new job. You want to look and feel your best so you decide to wear your nicest boxer briefs and undershirt. When you’re getting dressed, you discover that your best white undershirt has turned a dingy yellow, and the nicest boxer briefs you can locate have a stretched-out waistband. It might not ruin your entire day, but it could leave you feeling less confident. When you buy in bulk, you will have a supply of new underwear ready and waiting for such an occasion. 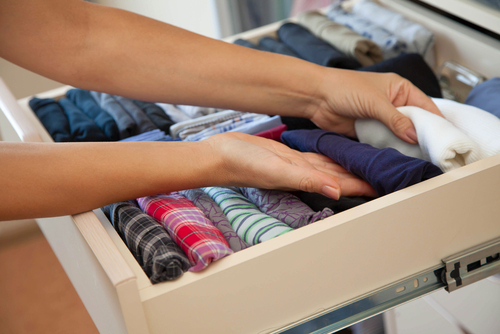 Wouldn’t it be much easier to have a few pairs of boxers and some unworn undershirts put away so you don’t need to make a last-minute run to the store? You might be able to get away with wearing your favorite jeans several times before washing them, but undies are only good for one-time wear. When you buy a small package, you only have enough to get through a few days before needing to do laundry. If you buy in bulk, though, you can have enough undergarments on hand to get you through a few weeks. Who wouldn’t love doing laundry less frequently? It seems like there is a new natural disaster every time you turn on the news. From blizzards and ice storms to all sorts of other devastating disasters, there is a lot that could happen to prevent you from being able to wash your clothes. While Tide’s Loads of Hope Disaster Relief Aid helps people in disaster-stricken areas wash their clothes, stocking up ahead of time could save you from having to depend on such a service in an emergency. We take a lot of things for granted–like being able to wash our clothes whenever we want. But if something goes wrong and you are left without power for several days, you’ll quickly realize just how comforting something as simple as a pair of clean underwear can be. Buying wholesale underwear and putting some in storage means that you will have a supply of fresh, clean undergarments if you are ever faced with such a disaster. There are a lot of great reasons to buy underwear in bulk. Doing so saves you time and money and ensures that you won’t run out of this essential clothing item during times of need. At The Adair Group, we offer wholesale underwear from trusted name brands like Gildan and Hanes. Browse our selection now to stock up on the wholesale underwear products you need!